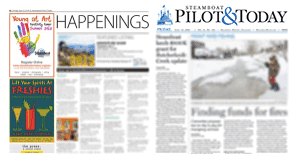 I find recent letters to the editor urging people not to sign the petition to put the West Steamboat annexation to a vote and accusations about the motives of the Let’s Vote Steamboat petition circulators disturbing. One person has shown up periodically at a business where Let’s Vote Steamboat has been collecting signatures and created a “scene.” My encounter with him was when he shouted from about 15 feet away that I was lying and was anti-growth. He’s made no attempt to actually engage in conversation about the annexation. The outcome of his behavior has been that the manager justifiably decided that he can’t allow that kind of thing outside his business and asked us not to gather signatures there anymore. My primary concern is that the current West Steamboat Neighborhoods will not provide affordable housing, except perhaps 50 rental apartments on two acres. The approximately 150 so-called deed-restricted homes, including condos, will be sold to people with no asset limits. Your friendly neighborhood multi-millionaire could purchase one if he desired. Also, those “deed-restricted” homes are not “affordable;” they are being called “attainable.” Brynn Grey acknowledges that projected prices will increase as their construction costs increase — no surprise. I recognize the prices of homes in Steamboat Springs are unattainable to young professionals. I recognize their urgency to see the Brynn Grey development get underway. But, there is another segment of the community whose needs must be considered in the West of Steamboat area also. If truly affordable homes aren’t built in this annexation, then where? Let’s Vote Steamboat has continued to gather petition signatures despite the kind of behavior I mention above — despite the challenges of gathering about 1,500 signatures — because we believe strongly that the West Steamboat Neighborhoods annexation needs to come to a citywide vote. Petitions can be signed at Centennial Hall, 124 10th St., from noon to 2 p.m. and 4 to 5:30 p.m. Monday through Thursday this week.